A primary demographic of Bastille’s fanbase in 2012 were active Tumblr users. Sharing animated GIFs had proved very popular within this social network. Virgin Records approached Idea Junction to refine the concept and to produce a mechanic to share Bastille’s new Flaws video across Twitter, Facbook and Tumblr. 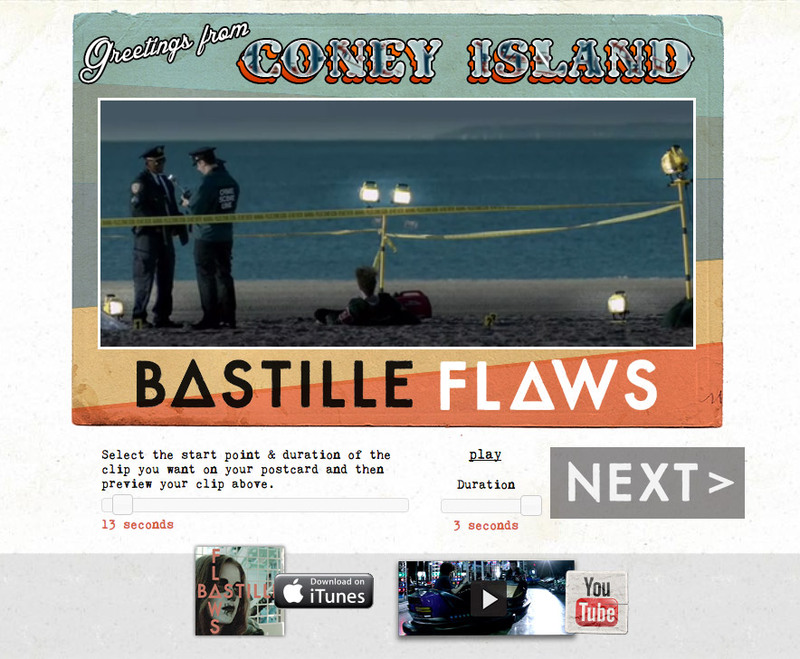 Idea Junction created an animated GIF postcard that could be customised with any chosen part of the Bastille Flaws video. The user could add a personalised message and share it across social media sites, with a scoreboard denoting the most viewed postcards. This scoreboard was linked to a merchandise prize to further promote sharing. Preorder and purchase links and a link to the full video were prominently displayed.